Scary Monsters #102 Cover Art Print Poster by Scott Jackson - 3 Sizes Available! 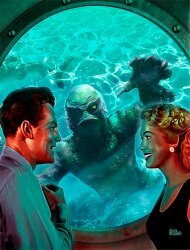 MyMovieMonsters.com > Scary Monsters Poster Art Prints > Scary Monsters #102 Cover Art Print Poster by Scott Jackson - 3 Sizes Available! Direct from Scary Monsters cover Artist Scott Jackson to YOU, the BEST HORROR FANS anywhere. New cover art print offerings from the Scary Monsters vault! Vibrant, quality printing with Ultrachrome HD inks on thick premium art stock. Suitable for framing. Signed by horror, heavy metal artist Scott Jackson Monsterman Graphic. All orders ship within 5 business days, and there's no extra shipping cost for multiple poster orders. Purchasing Instructions: You must select shipping destination and poster size from the drop-down menus above.